Fall is the perfect season to celebrate the beauty of trees. Color-changing, wind-buffering, rainwater-absorbing, trees tend to take center stage at autumnal time. Hope College sophomore Katelyn DeWitt, however, appreciates their value all year round. And she doesn’t mind being called a tree hugger because of it. Actually, that is exactly what DeWitt did for ten weeks during the summer of 2018. 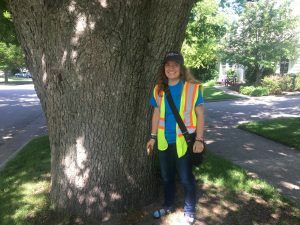 She embraced her work with trees while inventorying and measuring the trunk diameters of nearly half of the tree population (so far 3500+) found on public property in the City of Holland. In doing so, she dug into determining the environmental and monetary values of various species in the city’s urban canopy. What she found is confirmation, and then some, of Joyce Kilmer’s famous “Trees” poem. There is indeed nothing lovelier than a tree when it comes to the myriad of environmental benefits it provides in addition to its aesthetic value. Drought and flood mitigation, climate stability through carbon sequestration, pollution filtration, noise reduction and wildlife habitation are all the ecological workings of a tree. 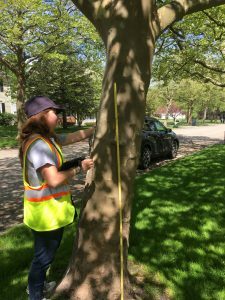 Natural benefits aside, the so-far-surveyed trees in Holland are projected to provide more than $16,166 in environmental value annually, according to DeWitt’s preliminary calculations that do not factor in electricity offset yet. DeWitt took on the collaboratively- funded project (by the City of Holland, Hope College Biology Department and the Holland-Hope College Sustainability Institute) simply because “I’ve always liked trees,” says the biology major, “and I think it’s important to know more about them to help the world we live in.” Directed in her efforts by Dr. Kathy Winnett-Murray and Dr. Greg Murray, professors of biology, and Michelle Gibbs, director of the HHCSI, DeWitt spent her days identifying and measuring the diameters of 3,663 trees at a consistent height of 1.37 meters, also known as diameter at breast height (dbh), the universal standard to measure trees in field studies. “From that (dbh) you can infer a number of things about how much the tree is absorbing carbon, or how much it is offsetting energy costs,” says Winnett-Murray. All of those tree-benefit computations are calculated by iTree, a software program developed by the U.S. Forest Service, and used from coast to coast for forestry studies. DeWitt used iTree to determine the $16,166 in public tree value mentioned earlier. 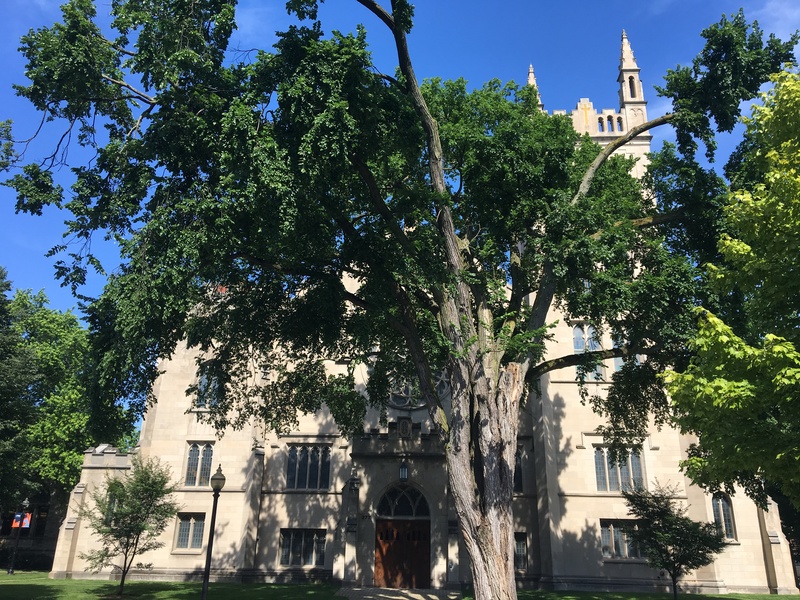 Near Hope’s campus, DeWitt’s favorite tree is the American elm found in front of Dimnent Memorial Chapel on the right of way of College Avenue. From past studies of that tree, DeWitt estimates that it is approximately 190 years old. 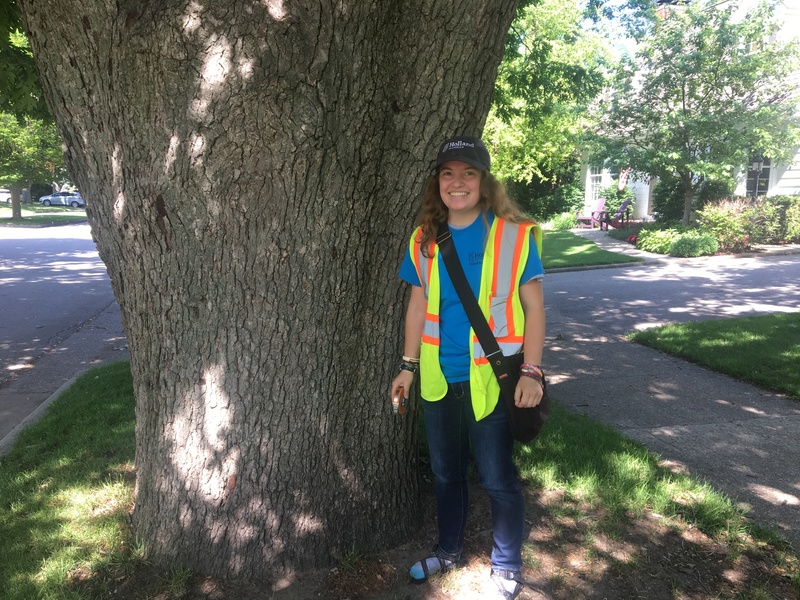 From her present study of the tree using the iTree program, she also estimates that the big, old American elm removes 43.3 ounces of pollution a year, helps avoid water runoff at a rate of 92.2 square feet a year, and sequesters 81.6 pounds of carbon a year. And that’s just one tree. In all, DeWitt found 94 species of trees on Holland’s public property, the most common being the Norway maple, a non-native tree. The second most common is the native sugar maple. 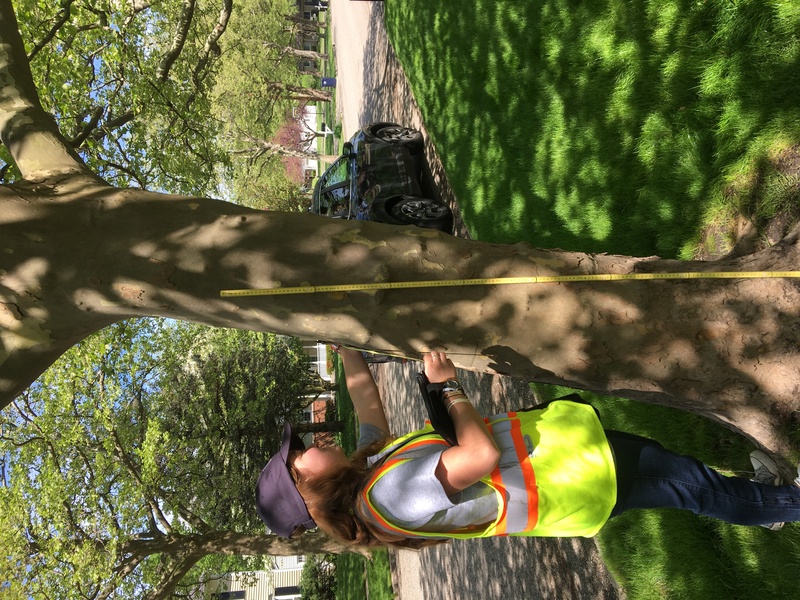 Natural benefits aside, the so-far-surveyed trees in Holland are projected to provide more than $16,166 in environmental value annually, according to DeWitt’s preliminary calculations that does not factor in electricity offset yet. Others in Holland now have the chance to learn from DeWitt’s work as well. 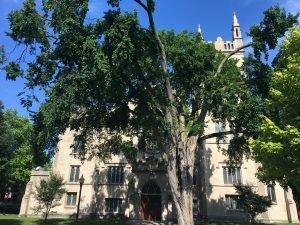 A new Android phone app developed by Dr. Michael Jipping, professor of computer science, and two of his Hope Summer Software Institute students, helps users identify Holland trees as it accesses GPS coordinates along with the Holland tree database entered into the application. “Treesap, Bringing People to Trees” can be downloaded from Google Play, and it’s free. It’s used by “walking up to a tree on Holland public property and clicking the big red button on the interface, and it will identify the tree for you, or tell you the tree is not in the data base yet,” says Jipping. “As the database grows, more trees will be added.” Jipping also hopes to have an iPhone version of the app completed within a couple years. Hugs for trees and software developers, in the Holland Tree Project, you can just feel the arboreal love. Katelyn, This brought me great joy. Holy TREES! And Holy YOU! What a wonderful project! I’m on the Creation Justice Team at DUCC church. I am going to make sure this is brought to the attention of everyone. Your great good spirit shines. And Eva, of course you did it again, bringing Katelyn to life, blending researched material and down to earth experience so beautifully. Thanks to each and both of you. This is exceptionally uplifting—and I don’t need to say to you that such is sorely needed.